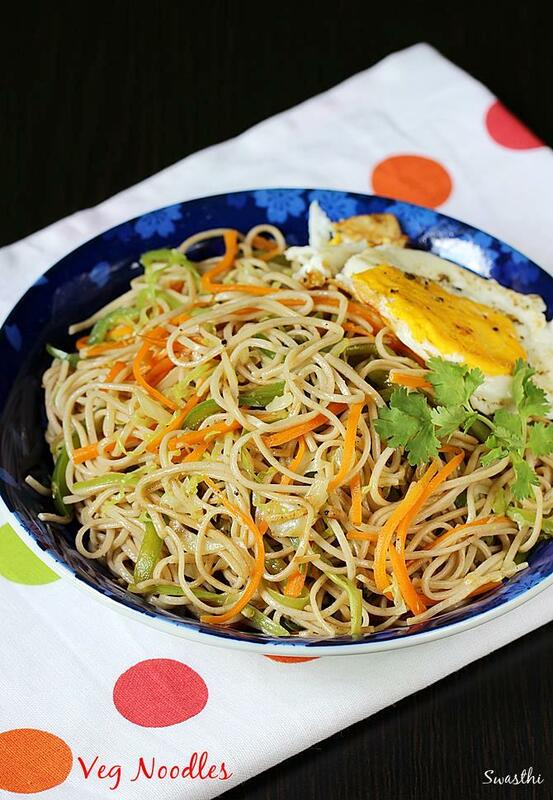 Veg noodles recipe – A quick dinner idea for busy week nights. 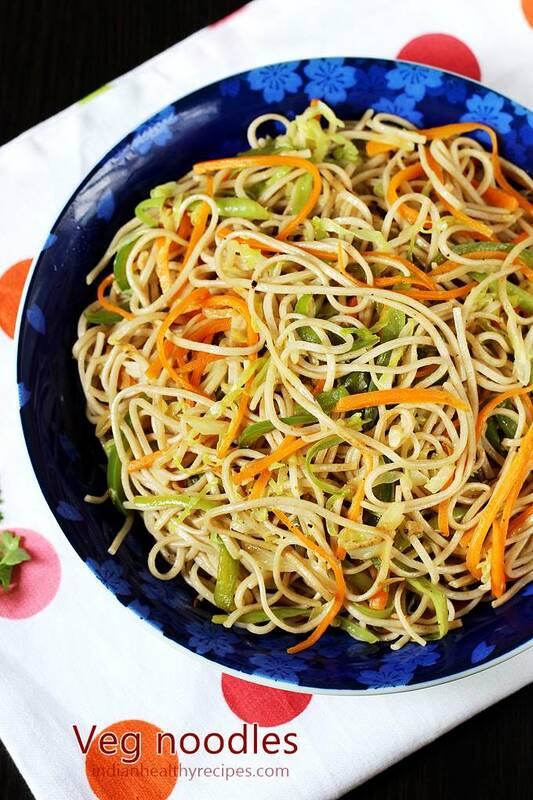 Making this healthy & delicious vegetable noodles is super easy. It takes only 20 mins to make 2 servings. This also goes great with a saucy Indo chinese side like Gobi manchurian, Veg manchurian, Chilli paneer etc. As such it tastes great on its own even without a side. You can use any of your favorite veggies like cabbage, carrots, capsicum, zucchini, broccoli, cauliflower, green peas, bean sprouts and beans. As with any fried noodles recipe this one too has to be prepared on a high flame that lends a smoky aroma. A heavy bottom pan, cast iron skillet or a kadai or a wok will work very well for this. If you have one do use it. 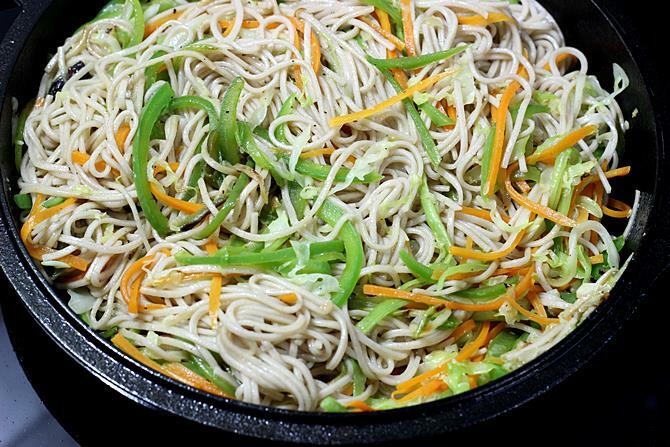 To flavor the veg noodles, you can use soya sauce & any hot chilli sauce of your choice. You can also make this without any sauce or vinegar. 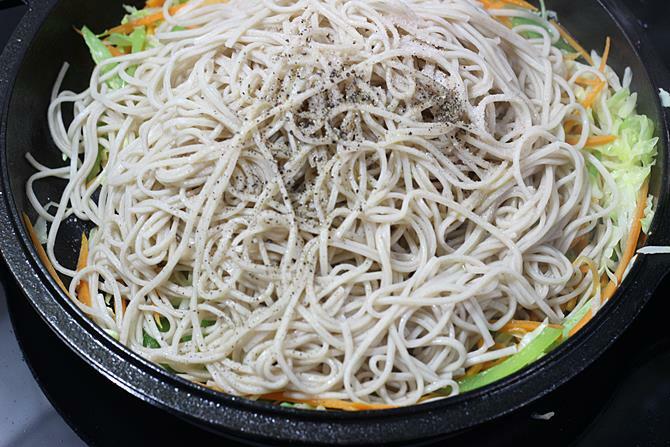 Just add a single strand of mace and a star anise to lend a wonderful aroma to these vegetable noodles. 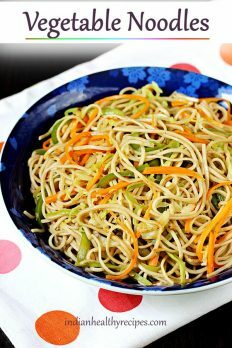 Veg noodles recipe that is super quick to make with a handful of ingredients. Vegetable noodles taste delicious & can be served on their own or with some fried egg or Chinese sides like chilli paneer or gobi manchurian. Bring 4 to 5 cups water to a boil. Add the noodles and cook them al dente without making them mushy. Follow the instructions on the pack for cook time. Drain and rinse them well in cold water. Sprinkle 1 tsp oil and smear it to the noodles to prevent them from turning sticky. Set aside. While the noodles cook, prepare the veggies. Add oil to a hot pan and put on to a high flame. 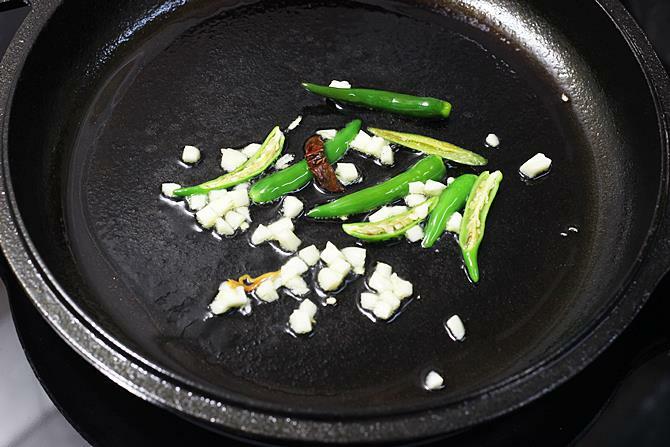 Saute garlic, green chilies, mace (optional) and star anise (optional) for a minute. If using onions saute them for a minute. 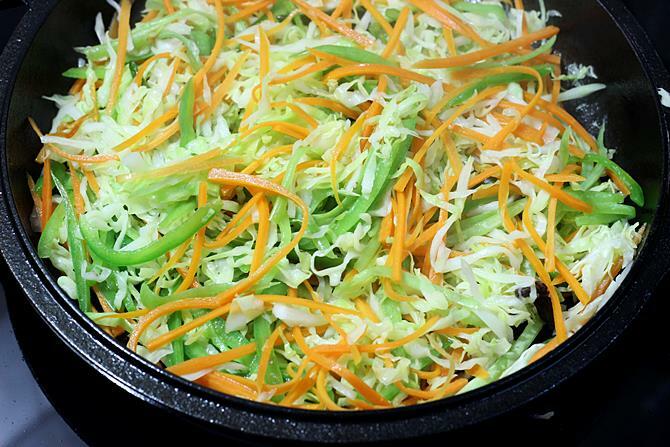 Add carrot, bell pepper & cabbage. Toss & saute for 2 to 3 mins until they are half done yet crunchy. Pour in vinegar, soya sauce & hot sauce if using. Add cooked noodles, pepper and salt. Toss and stir fry for 2 mins. Serve veg noodles hot or warm. 1. Bring water to a boil to cook noodles. I used organic soba noodles (made of wheat flour & buck wheat flour/ kuttu in hindi) which calls for cooking for 4 minutes. You can simply follow the instructions on your pack for the cooking time. Do not overcook as they turn mushy. While the noodles cook shred the veggies. I used about 2 heaped cups of cabbage, 3/4 cups of carrot, 1/4 cup of beans, 3/4 cup capsicum. You can use upto 3 1/2 cups of mixed veggies. Make sure cabbage is well drained. 2. When the noodles are cooked al dente, drain them and rinse with cold water. Drain in a colander & smear some oil to keep them non sticky. 3. Heat a pan with olive oil on the highest flame. Add chopped garlic & slit green chilies. I also use 1 strand of mace / javitri and star anise. Saute until the garlic smells good, just for a minute. Make sure you use enough green chilies for the heat if you do not prefer to use any sauce else the noodles will be very bland. 4. I skipped onions. If you are using toss them for a minute or 2. Next add all the veggies. 5. Fry stirring often for 2 to 3 minutes. 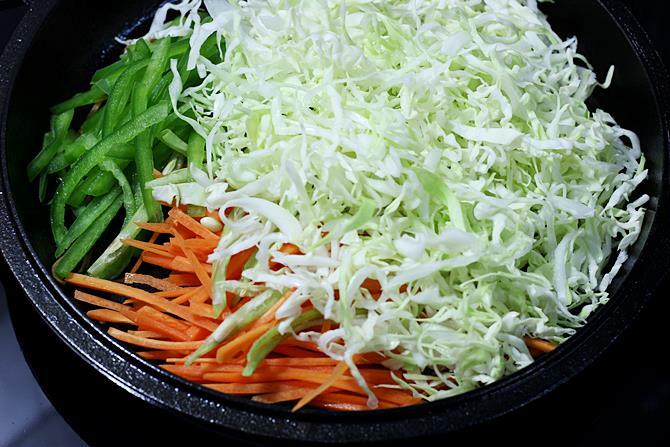 Do not over cook, we want the veggies to be crunchy. 6. Pour soya sauce, hot sauce and vinegar. I skipped the sauces and just drizzled some vinegar. Add drained noodles, salt, pepper and then some more olive oil. Add salt with caution if you have used it already while boiling. 7. Toss or mix and fry for 2 mins without burning. If you like your noodles to be slightly tangy, you may add some lemon juice just before serving. But the flavor of vinegar cannot be replicated. But these veg noodles taste great, just use the right amount or generous amount of olive oil, salt and green chilies. I made some fried eggs in the same pan. Set aside the noodles to serving plates. Add 2 tsp oil to the hot pan. Just pour your egg on the hot pan and cook on a low heat until the yolk is partially set. Flip it and cook until done. Sprinkle some salt and pepper. For step by step photos, you can check this post on fried eggs. 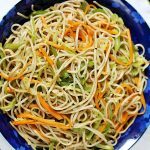 The vegetable noodles recepie came out perfectly.my kids loved it. Without d use of soy sauce. I used few drops of vinegar though. Simple and easy to make.ur step by step pics r of great help. Thanks for following the blog. Glad to know they are useful. Is there any substitute for the taste maker that is given in instant noodles packet? I used to make my own taste maker before using onion powder, garlic powder and few other ingredients. Later stopped them as they too are store bought and may not be healthy. There is no replacement for tastemaker. I didnt get you. Are unable to get the consistency of whipped cream ? With which cream did you try? hi the recipe is so easy and yet so delicious! can i use any kind of noodles, cause i have maggie noodles and i dont like the taste maker, can i make this recipe with the noodle cakes? Hi Swathi, thanks for this recipe, will try it for my lil one, could you pl suggest a quicker way to chop the vegetables so finely? Also Could you pl suggest some iron rich vegetarian recipes for a picky toddler? A food processor does the job. You can try beetroot pulao, methi rice, methi paratha, spinach paratha, ragi recipes.